The Frankfurter Rundschau reports on the case of Prof. Dr. Jürgen Kunze, who used to be the college president of the public business college (FHW) in Berlin and was the founding president of a private business college (OTA-Hochschule). Private colleges and universities are relatively new to Germany. It seems that in 2001 Prof. Kunze, a professor for finance, applied to the FHW for an academic leave of absence in order to set up this private college. He was relieved of his teaching duties, but his monthly salary kept rolling in. In addition, the new school also payed him a good monthly salary. According to German public college and university rules, you have to at least tell your school that you are getting a second salary. There is a complicated formula that determines how much of the second salary you have to hand over to the government. It seems, this was forgotten. The FHW also had granted his leave of absence giving as the reason that this was part of his "duties", which is quite unusual, as the government does not pay people to work for private companies. Kunze was fined 60.000 Euros, which is a bit more than a one year's salary. Kunze, who has been widely lauded for setting up this private school by the Lord Mayor and others, will be appealing this judgement by the lower courts. I am very happy to introduce you to another plagiarism researcher (and that is what Plagiointitutkija means in Finnish), Erja Moore. She is a sociologist and principle lecturer at the North Karelia University of Applied Sciences. She has been blogging about plagiarism in Finnish since 2008, and she also has a portal about plagiarism in Finnish, similar to my own in German. Apparently, education officials in Finland have decided that plagiarism is a non-problem. She was also at the conference in 2008 in England on plagiarism that I also attended (but we somehow didn't meet up there) and presented a paper on the situation in Finland (in English). She has also just blogged about my blog, I'm afraid that I don't understand more than the my name, the word for English (Englanniksi) and the word for German (Saksan). But I am very happy that more and more people are reporting on plagiarism online! Now that's a mouthful. But what I found interesting was the price: 794,99€. I suppose they sell a maximum of one. And it's in stock. And since there is no selling rank, I'm assuming there hasn't been a sale yet, although there is a used one up for grabs. On closer inspection I find the publisher: Icon Group International. Ah, yes. I've blogged about this publisher before. I call this write-only publishing, only useful for padding resumes. I suppose the price is so high so no one purchases it and then finds out that it only has blank pages or worse. "... In what follows, I summarize the economic potential for the world's major cities for "industrial and agriculture twine less than 3/16-inch diameter made from manmade fibers" for the year 2007. The goal of this report is to report my findings on the real economic potential, or what an economist calls the latent demand, represented by a city when defined as an area of dominant influence. [...] For many items, latent demand is clearly observable in sales, as in the case for food or housing items. Consider, however, the category "satellite launch vehicles". Clearly, there are no launch pads in most cities of the world. However, the core benefit of the vehicles (e.g. telecommunications, etc.) is "consumed" by residents or industries within the world's cities." 3/16 inch twine? Latent demand? Satellite launch vehicles?. I checked out the author, Philip M. Parker. Goodness, what a busy man. There are 107.181 entries in Amazon's database! The first is a history book, the proceeds of which will go to finance Webster's online dictionary? Expanding the cover I find him listed as a professor and a Ph.D., a "Chaired professor of Management Science INSEAD (Singapore and Fontainebleau, France)". INSEAD has a web site, although there is some discussion on web sites as to whether or not this is a diploma mill. 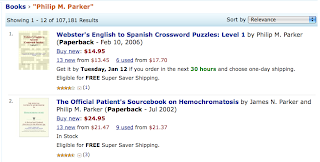 And there is a Philip M. Parker there, a professor for marketing. He lists only 7 books on his web site, none about 3/16 inch twine. He is also listed as responsible for the site "Webster's Online Dictionary", apparently the name is in the public domain. Ah, the Wikipedia tells us what's up: He has a patent on producing publications by software, using the print-on-demand publisher IGI. There have been articles in the New York Times and the Financial Times Deutschland. This is absurd. These are not niche products. They are spam. They are clogging up databases. And it proves to me that a reference on a resume that lists IGI as the publisher is not worth the paper it may be printed on. The new German Minister for Family Matters (Kristina Köhler, 32, unmarried, no children) has had her lawyers send a threatening letter to the Bild-Zeitung, the Süddeutsche Zeitung reports. It seems that the Bild-Zeitung was looking into some "irregularities" concerning the dissertation of Frau Dr. Köhler. The Süddeutsche had also reported on the amazing capabilities of Ms. Köhler, who managed to write her dissertation while being a member of parliament. She had some help from the national organization of her party to send questionnaires to 180 members of parliament from her party and to select and send the questionnaires to 1000 members of the party. Her goal was to see if the values of the representatives were similar to members of the party. She also paid someone to put the questionnaire into a computer and to do the layouting, the Süddeutsche reports. The Bild-Zeitung was busy doing some deeper research into the matter, when the editor-in-chief, Kai Diekmann, received a letter from Köhler's lawyers just before Christmas - but it was not Christmas greetings. He publishes the letter in facsimile in his blog. They are threatening to sue the newspaper for damages if they publish anything "wrong" about this topic. There have apparently been a lot of journalists calling the CDU, the University of Mainz, and her advisor there, it seems. Her advisor does a lot of quite interesting research in the area of extremist parties and why people vote the way they do. The help [she received] was only of a technical nature and concerned the sending of the questionnaires, the optical design of the questionnaire, putting the data in machine-readable form, problems with the software, and doing the layout and formatting of the thesis. [...] The amount of this help was known to the mentor and he accepted it. Of course. Thank you for setting this straight. She did note in her thesis (it has been reported, I could not obtain a copy to check myself) that she had used this help, so the University of Mainz knew what it was doing when it gave her the doctorate. She did nothing - legally - wrong. But morally? People who have spent years of their life doing everything themselves for their doctorates, perhaps even having their doctoral theses not accepted, may perhaps be excused for being somewhat bitter at this story. It makes one wonder - what exactly does it mean when you have "Dr." in front of your name? And why do the lawyers get active if there is nothing wrong here? Just put the thesis online and let everyone have a look for themselves. Perhaps this case finally makes it clear that we need a more widely accepted general definition of what exactly constitutes a dissertation, and not just the personal discretion of a professor who convinces his or her department that the results are worthy of conferring a title. Or maybe we can just quit using "Dr." as part of our names and as some sort of proof of superiority in German-speaking countries. A doctorate is only useful in academia, because it has to do with ability to do research. It should not be of value in business or politics or sports.